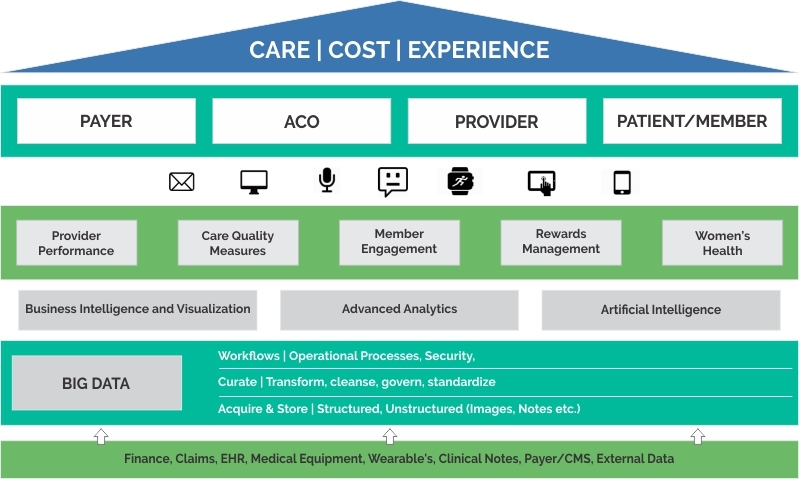 Through the use of digital technologies and intelligent systems, some healthcare organizations are attempting to solve complex problems in achieving the ‘triple aim’ – reducing costs, enhancing clinical quality and achieving superior patient experience. Yet, most initiatives have not delivered returns when measured against common organizational goals. ITC Infotech recognizes these challenges and recommends an integrated healthcare platform that leverages mobile and voice capabilities to get complete and better insights in planning and delivering care, while focusing on enriching patient and physician experience. The healthcare industry’s annual spends are touching trillions of dollars – a major chunk of the GDP, and is generating more data than ever before. Organizations are using this data to solve challenges of population health management, accelerate the shift to outcomes and value, imbibe patient centricity, improve chronic care management, and achieve financial optimization among others in a disjoint manner. The variety of healthcare data (from gadgets, claims, EHRs, Clinical notes, Lab reports etc.,) and its integration into a common platform to aid in generating effective insights and recommendations continue to be a major hurdle. Also, the methods and technologies available to physicians, patients, and administrators do not facilitate improvements in productivity, experiences or outcomes. ITC Infotech’s integrated healthcare analytics platform, aims to address the industry’s challenges using a unified approach to data and enable a single source of truth. Built on open source technologies, it has a common data model that supports storage and analysis of unstructured data and integrates with internal and external datasets and devices.